Inspiration Outside Autism: Stephen Murray! Sometimes while in the world of Autism it is hard to see outside our world. We are so tasked day to day with survival helping a child (or two) affected by autism that looking outside autism can be next to impossible. I gather so much strength from the families TACA serves. Lately, I have found inspiration and support outside our community as well. A few months ago, I had the opportunity to meet an incredibly inspirational person: Stephen Murray. I was introduced to Stephen via Pat & Stephanie McIlvain – longtime Oakley employees, TACA Board member/volunteers extraordinaire, and TACA parents. Stephen was a world champion BMX racer, until a serious accident ended his career and he was forced to exchange his bike for a wheelchair. Stephen was a really big deal to that sport but after meeting him, I believe his new path will make him an even BIGGER deal in multiple areas outside his sport. 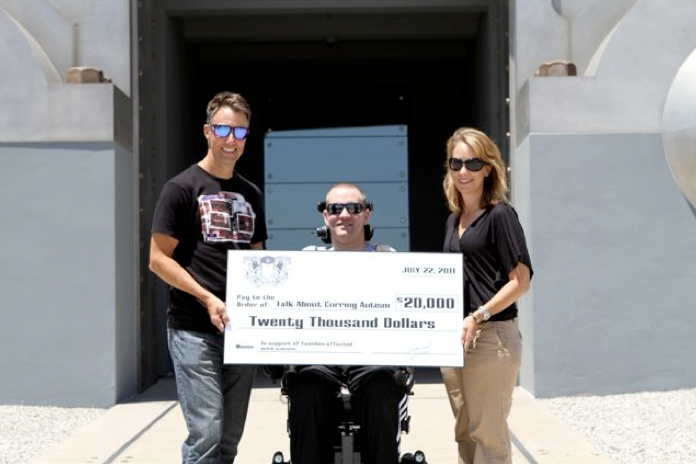 Stephen has generously guided $20,000 in donations to TACA via Oakley’s give back fund. He has glasses just like those that Oakley has branded for TACA, Livestrong and Breast cancer efforts. What’s more: He cares about our kids. He looks beyond his situation to help others, and the challenges faced by kids living with autism resonate with Stephen. I just had to meet Stephen and thank him in person for his generosity. It was so great to chat with him, about life, about his efforts to help others, about his refusal to be defined by an injury. One word comes to mind when I think about Stephen: amazing. I am so touched by how much he cares and how much he is willing to give back, despite the obstacles he has faced and continues to face daily. I am also very surprised by the similarities between spinal cord injury and some of the health issues and physical challenges our kids face. By looking outside the autism window, I was reminded how much we can learn from others and how much we can help one another grow. It’s a big world and we are all in this together! The biggest thing Stephen taught me is this: When you think you have nothing left – reach inside and dig deeper. You are stronger than you know – and there is nothing like adversity to prove it. Once again, Oakley is responsible for bringing something really cool to my life, this time in the form of Stephen Murray. I can’t begin to tell you how much Oakley has done for TACA and how their support has helped us reach new levels as an organization. Not only are they generous in their financial support, but their employees donate significant time assisting with TACA events, helping with business and strategic planning, and including TACA in select advertising and marketing campaigns. TACA could never afford to pay for the level of exposure Oakley provides us. Oakley has much to teach other huge companies about corporate responsibility, driving change, raising funds, and building partnerships within and throughout different communities. By connecting TACA with Stephen Murray – Oakley opened a door for all of us – to understand each other’s challenges and victories, to share best practices and to help one another. It feels like the beginning of another beautiful friendship – and I feel blessed to be a part of it! Great common sense here. Wish I’d thuohgt of that.